Your yard is part of your home just as much as your family or living room. We want you to take pride in your yard and enjoy it as much as you do your indoor space. We will service your property on a weekly basis or however frequent you desire during the growing season. As lawn and garden specialists, our goal is to give you an outdoor space that is welcoming and maintenance free. All you need to do is sit back and enjoy your healthy, lush lawn! Ongoing Maintenance: Mowing and basic lawn care provided weekly. You will be billed at a monthly rate. Spring/Summer/Fall Cleanups: These are one-time cleanups to help you prepare for the upcoming season or to spruce up your yard for a special event or party. Mulch: Adding mulch to your existing landscape is more than just aesthetically pleasing. 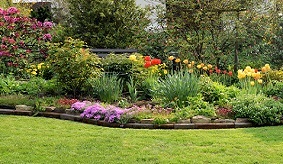 Mulch promotes healthy plant life by preventing weeds and retaining moisture. Also, it’s ideal for reducing the amount of water your landscape will need. Flowers: Let us know about your favorite plants and we will add them to your landscape. Sod Installation: Adding sod to your landscape is a great way to get a green lawn quickly and easily. Christmas Lights: We can hang lights on your home or on the trees around your home. "Very professional. Hard working. Well worth the price and very competitive in market. Anyone who hires them, won't be disappointed." "Sumner was very customer focused. He arrived when he said he would and came back to make sure the job was done to meet my expectations. He communicated with me throughout the entire process. Definitely a good business to recommend."